Nugent has always had blues and old time rock and roll in his music, and the blues classic “Baby, Please Don’t Go” – first made popular by Delta bluesman Big Joe Williams back in 1935, followed. 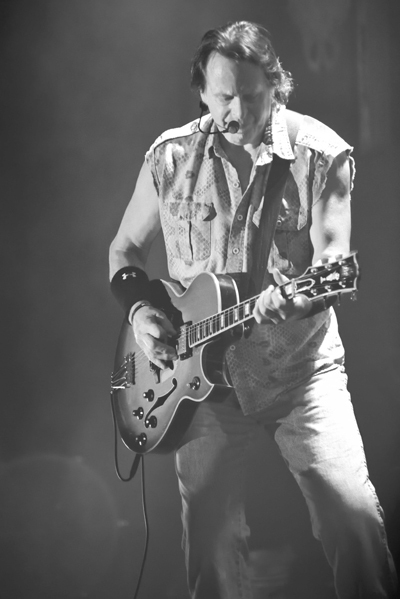 Nugent’s ‘70’s era hits were expected and delivered such as “Stranglehold,” “Cat Scratch Fever,” “Free For All.” There were also lesser known songs from his most prolific ‘70’s glory, such as “Good Friends And A Bottle Of Wine,” Paralyzed” and “Fred Bear.” The vocalist and co guitraist of Nugent’s biggest songs in the ‘70’s was Derek St. Holmes. Holmes has been guesting at some shows in the past few years, but for a long time they had been estranged. Nugent sang himself here, but St. Holmes is a stronger singer for sure. While it was nearly a full house of a few hundred people, but I couldn’t help but to think how Nugent filled stadiums in his late ‘70’s heyday. But alas, that’s the way it goes for much of Nugent’s baby boomer contemporaries. Nugent is happy to still be healthy and working, though. He showed much enthusiasm when closing out the show with “The Great White Buffalo/Spirit of the Wild.” Appropriate for this renegade who’s still louder, prouder and more untamed in many ways than any other performer I can think of.